Next year will be the 50th Anniversary of Earth Day! The first Earth Day occurred on April 22, 1970, and I will show my age and admit that I clearly recall marching around my little campus on a blustery spring day in Topeka. Now, 49 years later, we want to celebrate Earth Day by highlighting some jobs that take care of our planet. One way we keep track of jobs in the United States is through the Occupational Outlook Handbook which provides career information for hundreds of occupations. The Occupational Outlook Handbook was first published in 1949 to serve returning veterans of World War II. This year, the Handbook is 70 years old! 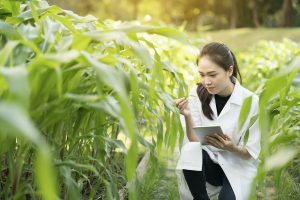 What they do: Solve agricultural problems concerning power supplies, the efficiency of machinery, the use of structures and facilities, pollution and environmental issues, and the storage and processing of agricultural products. What they do: Test, operate, and, if necessary, modify equipment used to prevent or clean up environmental pollution. 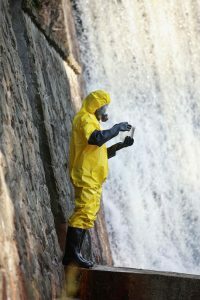 They may collect samples for testing, or they may work to mitigate sources of environmental pollution. 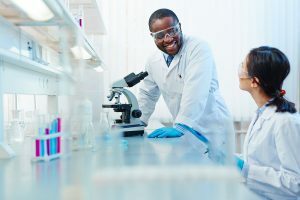 What they do: Study the chemical and physical principles of living things and of biological processes, such as cell development, growth, heredity, and disease. 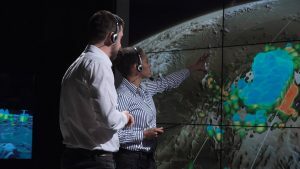 What they do: Study the weather and climate, and examine how those conditions affect human activity and the earth in general. 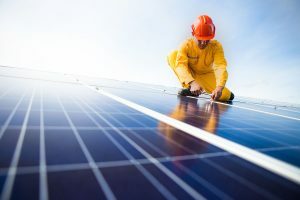 What they do: Assemble, install, and maintain solar panel systems on rooftops or other structures. What they do: Use their knowledge of the natural sciences to protect the environment and human health. They may clean up polluted areas, advise policymakers, or work with industry to reduce waste. Want more information? You can explore hundreds of occupations using our Occupational Outlook Handbook. For a larger list of new and emerging earth-friendly or “green” jobs, visit the Department of Labor’s O*Net Resource Center. The wait is over! The BLS Local Data app — a mobile application that connects users with the data they need to know about local labor markets — is now available for Android devices. Search “BLS Local Data” in Google Play. 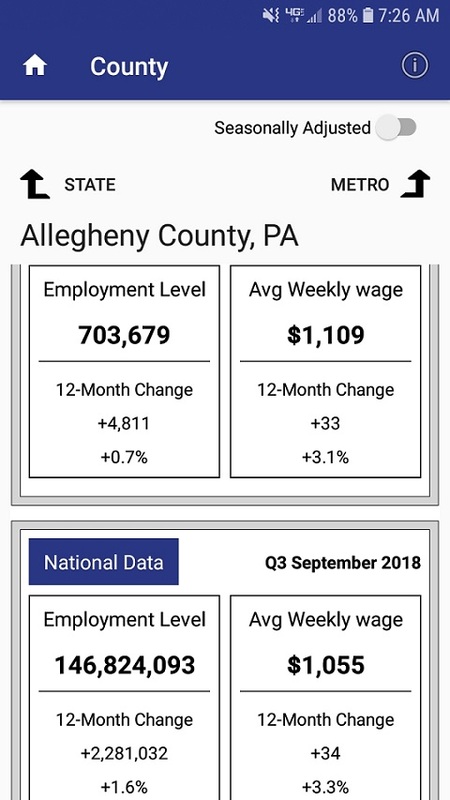 The BLS Local Data app, first released for iPhones last fall, uses the BLS API to present local data and national comparisons for unemployment rates, employment, and wages. You can search using your current location, a zip code, or a location name to find relevant data quickly without having to navigate through the huge BLS database. With one click, you can find data for states, metro areas, or counties. BLS continues to partner with the U.S. Department of Labor’s Office of the Chief Information Officer to expand the features and data in the app. A second version is in development and will be available soon for both iPhone and Android devices. Version 2.0 will include employment and wage data for detailed industries and occupations. It also will have new charting functionality that will allow users to plot the historical unemployment rate time series for their local area of interest. Check out the app and bring the wealth of local labor market data produced by BLS directly to your mobile devices! William W. Beach became the 15th Commissioner of Labor Statistics in March 2019. I am a little late with my first blog, but I’m sure readers can appreciate what it means to start this job as Commissioner of Labor Statistics on a week that ends in the publication of the Employment Situation report. Every moment of my first week at BLS has been highlighted by the unfailing grace and cheerfulness of the career staff. I felt very strongly that my first blog as BLS Commissioner should be about the late Alan Krueger’s pioneering work, particularly as it relates to both the Department of Labor and the Bureau of Labor Statistics. I have been thinking a lot about Alan Krueger since his passing on March 16. Thinking about the loss, of course: the shock of losing such a penetrating mind, such a courageous scholar. And thinking about the insights and breakthroughs he could yet have made: at 58, Alan Krueger was striding strongly. The past three weeks have seen a steady flow of recollections in the popular and professional press. Let me recommend two highly accessible pieces: Ben Casselman and Jim Tankersley’s New York Times essay and Larry Summers’s deeply thoughtful recollection in the Washington Post. There are more out there and more to come. I’m writing today to remind us of Professor Krueger’s close ties to our daily work. He, indeed, connected in so many ways. First, he was a consummate though sometimes reluctant government economist. Dr. Krueger served as the Department of Labor’s chief economist from 1994 to 1995, returned to the federal government service in 2009 as an assistant secretary in the Treasury Department from 2009 through 2010, and finally served on President Barack Obama’s Council of Economic Advisers from 2011 through 2013. This service record as a government economist, as important as it is, is not Professor Krueger’s deepest tie to BLS. Rather, and second, he stood out among peers for his leadership as an empirical economist. Starting with his celebrated study of the economic effects of the minimum wage in 1994, when he and David Card pioneered the use of natural experiments in policy analysis, to his recent pathbreaking work on the opioid crisis, Alan Krueger made important contributions to our understanding of work and public policy through innovative use of data. This is what ties him most to us, in my view. His sometimes controversial conclusions to one side, Professor Krueger looked at the world when he wrote. That may seem an obvious posture for any economist, but too often analysts look elsewhere: for instance, they wrap themselves in strictly theoretical work or confine their own work to the research channels that others have dredged. While theory and replication are essential parts of our profession, they cannot substitute for an active curiosity about the real world and how it is changing. Unless you’re looking out into the world, you may never see the amazing, new developments there that could inspire you to grow beyond the current limits of your economic understanding. It will take time to define Alan Krueger’s legacy in economics and public policy, but this much is already clear: he left a strong marker of what it means to be a labor economist and a public servant, and he showed two generations of labor researchers that the most fruitful laboratory for economic science is the swirling, crazy world outside our office doors. Strikes and lockouts? Aren’t those 1940s-50s-60s economic activities? Sounds like we are taking a trip to the distant past with Sherman and Mr. Peabody in the WABAC machine. (For you younger readers, these characters can be found in the Adventures of Rocky and Bullwinkle and Friends, a TV show from the early 1960s.) BLS first collected data on labor and management disputes (work stoppages) in the 1880s. BLS has continuously published work stoppage information since 1947, for events covering at least 1,000 workers. Recently, high profile work stoppages by public school teachers and others have kept these types of activities in the news. The work stoppages program provides monthly and annual data on major work stoppages involving 1,000 or more workers and lasting one full shift or longer. For this report, BLS does not differentiate between strikes and lockouts. Strikes are a temporary stoppage of work by a group of employees to express a grievance, enforce a demand, or protest the terms, conditions, or provisions of a contract. Lockouts are a temporary denial of employment by management. Detailed monthly reports from 1993 to the present provide the organizations and unions involved, along with the locations, industries, number of workers directly involved, and days of idleness. Work stoppages provide media, researchers, labor relations specialists, unions, and government agencies with information about labor-management disputes. While the work stoppages program does not report on the nature of the dispute, identifying the details of parties involved helps users assess the impact of compensation trends, union membership and activity, and legislation. 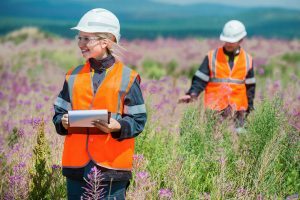 Has work stoppage activity changed over time? 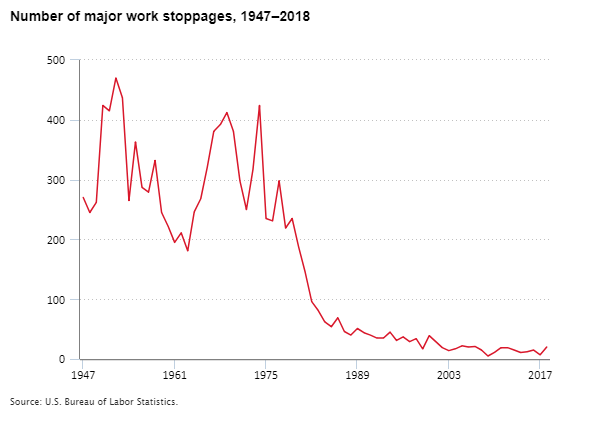 Since BLS began reporting on work stoppages, declines in union membership, the growth of the service industry, technological changes, and other factors have led to a significant reduction in the number of work stoppages. Between 1947 and 1956, there were 3,438 work stoppages. In the decade from 2007 to 2016, there were 143 stoppages. 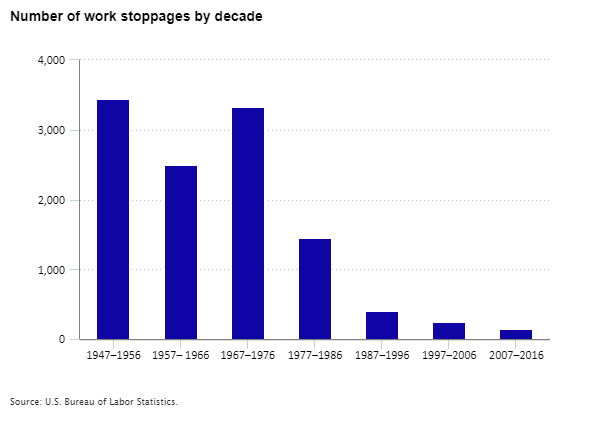 In 2017, there were 7 work stoppages, and in 2018 there were 20. Editor’s note: Data for this chart are available in the table below. Decreases in the number of work stoppages and the number of workers involved are especially noticeable during recessions. These levels reached an all-time low at the end of the 2007–09 recession. 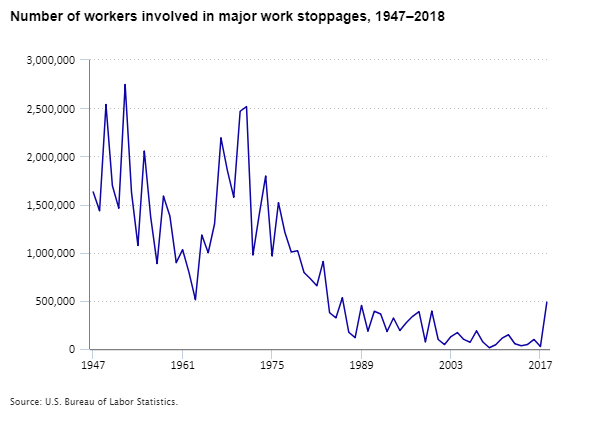 In 1952, there were 2,746,000 workers involved in work stoppages, whereas in 2018 there were 485,000 workers involved. 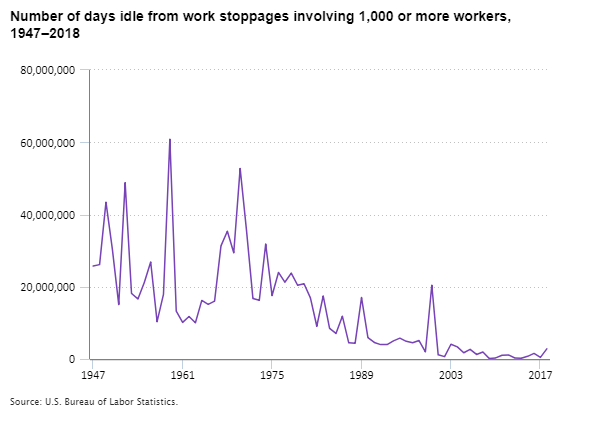 Another way to evaluate the impact of work stoppages on the national economy is by looking at the number of days workers are away from work because of strikes or lockouts. The number of days of idleness reached a peak in 1959, at about 60,850,000 days. The second largest number was in 1970, with 52,761,000 of days of idleness. In 2018, there were 2,815,400 days of idleness. Where are work stoppages most prevalent? Of the 559 major work stoppages between 1993 and 2018, 423 occurred in private industry, 95 in local government, 40 in state government, and 1 in both state and local government. Most stoppages during that period, 458, occurred within individual states, while 101 occurred in two or more states. California, the state with the largest share of national employment (13.6 percent), had the largest share of work stoppages, 24.2 percent. 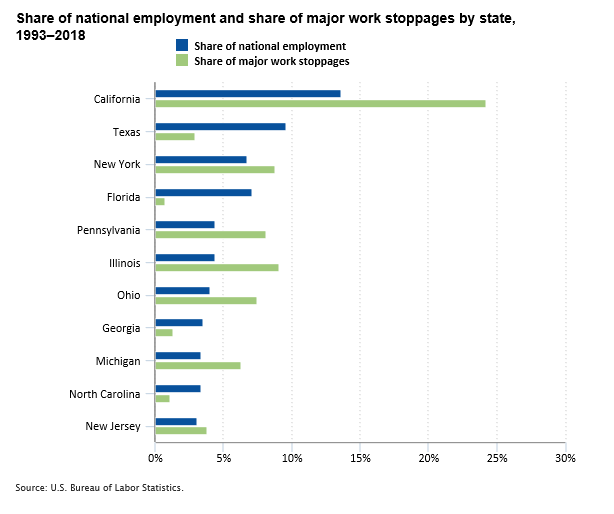 Texas, which accounts for 9.6 percent of national employment, accounted for 2.9 percent of all work stoppages (excluding interstate and nationally reported stoppages). These data also allow users to evaluate differences in the number of work stoppages by industry. 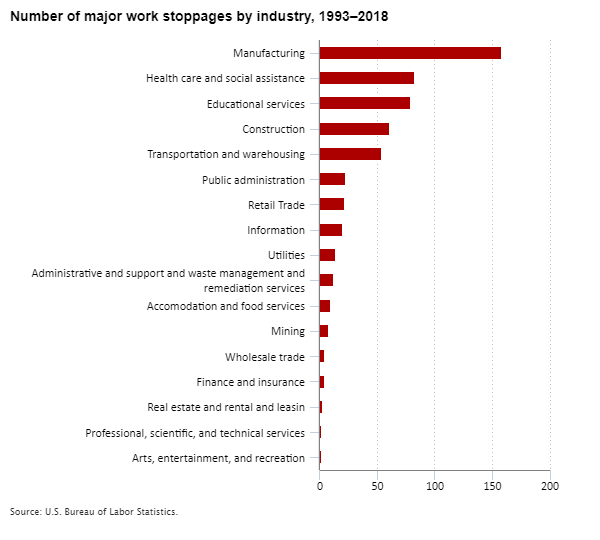 From 1993 to 2018, there were almost as many stoppages in manufacturing (158) as the next two industries combined. Health care and social assistance had 83 work stoppages, while educational services had 79 work stoppages. Of the 79 educational services stoppages, 75 were in state and local government, with 50 occurring in local government and 25 in state government. Read the latest work stoppages news release. Contact staff directly by email or call (202) 691-6199. We hope this discussion of work stoppages and a look to the past was almost as good as using the WABAC machine!